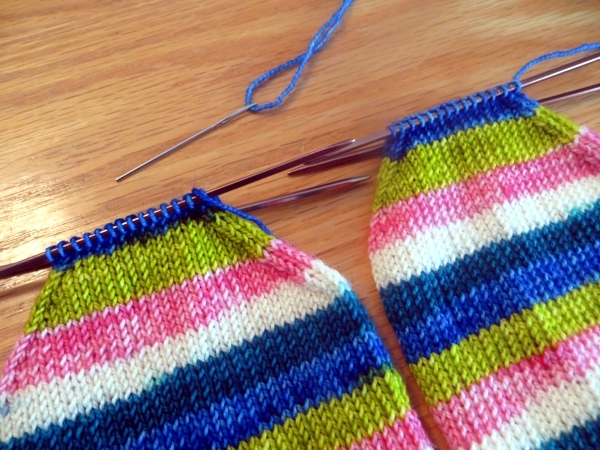 One of the reasons socks take so long to make is that they usually cover your leg as well as your foot. 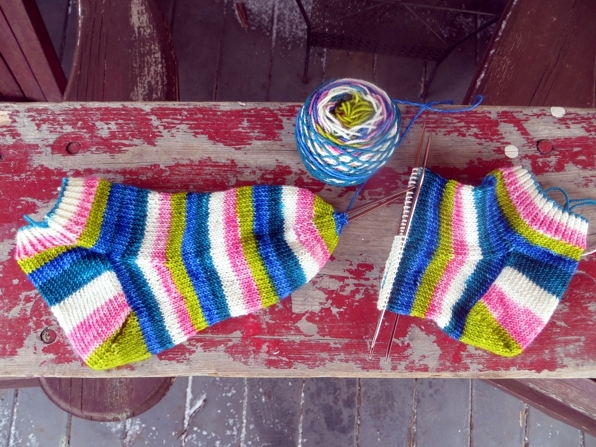 But the socks I cast on when I was finished the Six Day Socks had other ideas. I don't really know what happened here. It's true I've been thinking a lot about knitting socks for summer that would be viable even on a warmer day, because I feel safer operating the gas and brake pedals in my car when I'm wearing closed shoes with socks on. And then there's walking - serious tourist-type walking, I mean. 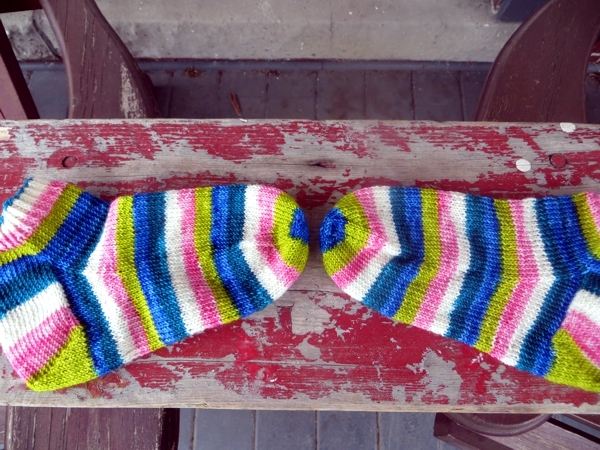 My feet are just much happier in good handknit socks if I ask them to go through a long day of urban hiking. 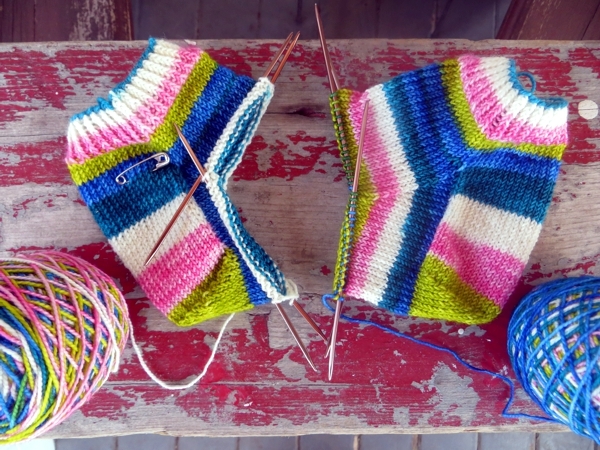 But I think mostly as I knit the first few rounds of these socks and saw how the colours were coming out, I knew I'd love them most from June to August, and that was going to mean anklets. 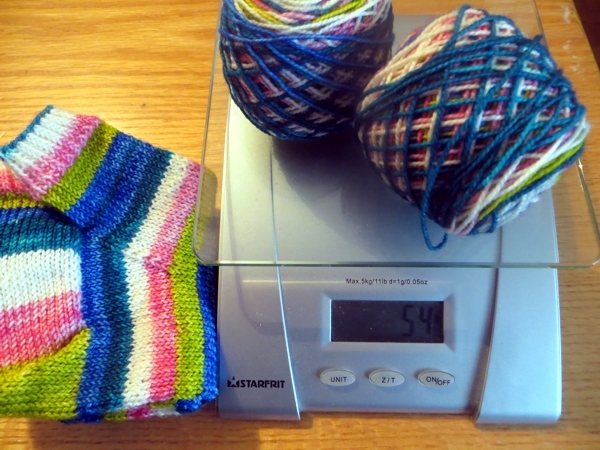 So when I'd done my standard 8 rounds of ribbing, plus another 10 rounds of sock, I started the heel flap. Man, when you cut out the leg? Socks go super fast. These ones didn't take a lot less time than the Six Day Socks, because I had some other knits to get done and other work I couldn't get away with ignoring, but in the time I did get to spend with them, they just zipped. I can almost do Kitchener Stitch a toe shut in my sleep now, which is something that always feels remarkable to me because it was such a struggle for so long to remember what to do next. Zip zip zip. These socks were ready to wear inside of a week, even if the weather outside was in no mood to cooperate. And here's the best part. 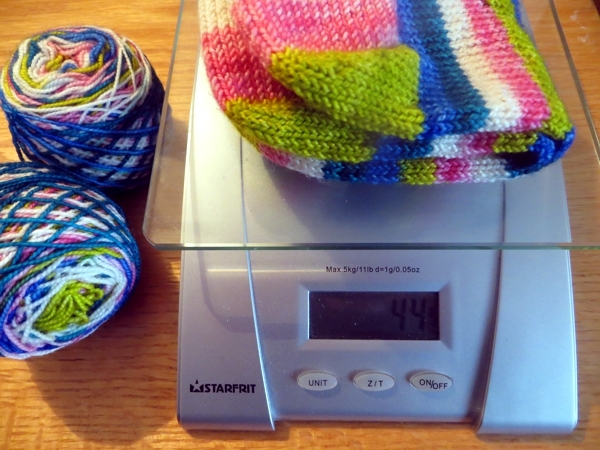 The socks took very little yarn to make - just 44g for the pair. Which means I have enough left in the cakes for another pair exactly the same. I know, boring - unless you're traveling or have shorts or tops that match one of the colours in them perfectly. In that situation, having two matching pairs means less time doing laundry. I'm all for that because less laundry = more knitting time. Hope you find some clever knitting shortcuts this weekend and I'll see you on Monday!